They don't all dress like this. Screamers are zombies which sit dormant in the centre of webs. A screamer itself is not usually very dangerous – the trouble is that if a screamer’s web is disturbed, the screamer becomes extremely noisy, and sometimes its awakening also causes nearby zombies to be more aggressive and dangerous than usual. The screamer may look just like an ordinary zombie. They sometimes wear strange blindfolds, headbands, or armbands – although it seems unlikely that they put these on themselves, as screamers are not much more intelligent than normal zombies, who are thick as planks. Screamers are usually found in the middle of strands or webs made of an unknown material. These webs attach to walls or to other zombies. Sometimes the screamer itself is caught in the middle of the web; sometimes it is merely lurking in an area in which there are a lot of webs cluttering up the place. Screamers usually only scream when they awaken; after that, unless they’re one of the rare nasty fast types, the screamer will be largely indistinguishable from a normal zombie. It’s rare for a screamer to go dormant again after being woken up, although if left alone for long enough this may happen. There are a few behavioural variations in screamers. The distribution of contaminated WhiteKnight-23 energy drink at Zombie LARP: Evolution caused the emergence of two new types of screamer: the ‘Banshee strain‘, whose extra-strong webs could trap White Knights and other dangerous creatures, and the ‘Flytrap strain‘, whose webs trapped living humans and kept them alive. Sometimes, screamers are fast and aggressive when they wake up, and in extreme cases, they even instil this behaviour in nearby zombies for a short time. The screamer made its debut at Better the Devil, and was a big part of Payday, Nightmare and Evolution, but hasn’t been used since. Setting up a nice big screamer web, full of zombies, is not worthwhile unless it can be almost guaranteed that humans will blunder into it. If a screamer web goes undisturbed, it means that the screamer, and all the zombies in it, have been standing around doing bugger-all for the entire round. So the screamer is a bit less likely to appear in open-ended games in large venues. Nevertheless, the screamer will appear again in some form, perhaps with modified rules – wait and see. 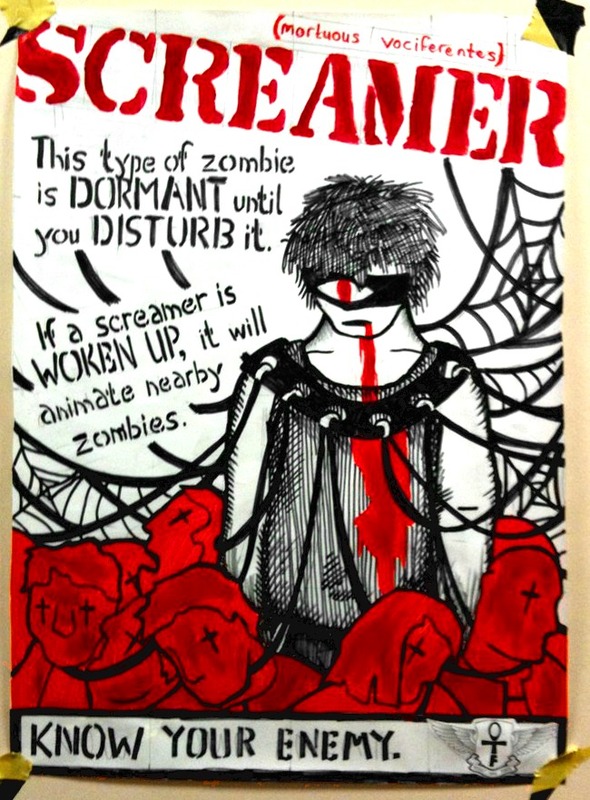 Screamers (and the zombies to fill their webs) are recruited from the available zombie population, and usually a player is expected to audition for the screamer role by screaming like a mad person.